Using innovative design and state of the art technology, the Rolex Sky-Dweller is a technological masterpiece that changed the way international travellers keep track of time. Launched in 2012, The Sky-Dweller is part of the Rolex Oyster Perpetual collection and is renowned for its usability and sophisticated design. 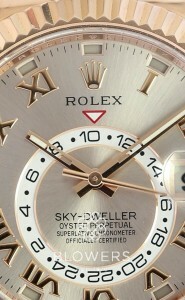 Protected by 14 patents, the Rolex Sky-Dweller uses its clever functionality to show multiple time zones. It features an automatic annual calendar, allowing jet-setters to easily change to local time whilst referencing their home time zone on the rotating off-centre disk. With the Sky-Dweller, Rolex introduced one their most complex calibres – the Calibre 9001, which offers a power reserve of 72 hours. Paired with a fluted bezel, the high powered Sky-Dweller offers wearers a versatile, luxury watch perfect for casual or dress wear. Blowers Jewellers buy and sell a wide range of pre-owned Rolex watches. We ensure the highest standard in each and every watch we sell. Looking for a particular watch? We can source it for you. 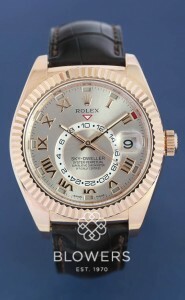 Contact us today or buy a second hand Rolex Sky-Dweller online.